I'm starting to believe that the enigmatic author K. J. Parker should concentrate on short form works. After the excellent Purple and Black novella last year, Blue and Gold is another winner. I haven't read Parker's The Folding Knife yet, but if it's half as fun as Blue and Gold it should be a very good read. By the way, I didn't forget to include the cover art with this review. The artwork isn't ready yet. . .
As I mentioned, the novella format appears to bring the very best out of Parker. The limited wordcount precludes unending technological and scientific details and explanations, which often get in the way of the actual storytelling in the author's novel-length projects. In short form, Parker's wit and sense of humor are allowed to roam free, making for a fun-filled reading experience. Although technical minutia doesn't bog down the narrative, K. J. Parker does elaborate on alchemy quite a bit. But such passages never hinder the plot. They simply had a layer of realism to the story arc. The pace is just about perfect. Indeed, I read Parker's Blue and Gold in one sitting. Not because it's such an engrossing read, but because it's so much fun that I couldn't put it down. Intelligence is one of the author's hallmarks, and it's very much present throughout the narrative. Yet it's Parker's sense of humor which carries this tale forward. Saloninus the Philosopher is a very smart men who has nevertheless made a series of questionable choices in the past. Unscrupulous, he makes for a great POV character. The novella is written in the first person, ensuring that we see everything unfold through Saloninus' eyes. And the fact that he lies throughout Blue and Gold as he tells his story means that there is never a dull moment from start to finish. As was the case with Purple and Black, Blue and Gold is a well-crafted and amusing novella. It's a work that should thoroughly satisfy Parker's fans and win the author a new audience. K.J Parker has been my discovery of the year. You prompted it with your review of A Company. I then read the Scavenger Trilogy which has been a great read. I love the realism & dark humour of her books. I also quite like their technical side. Ican't wait to put my hands on The Folding Knife and now on this one too. 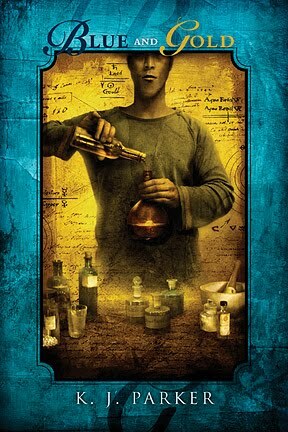 fun, intelligence, alchemy. Those are some of my favorite things! I think I will be picking me up some KJ Parker. thanks for the great review and recommendation!